Usually it is the 1st inning that causes Duane Underwood, Jr. problems but it ended up being a three-run 5th that put the I-Cubs in a hole. The team would fight back to tie it and send it to extras, but after Mike Freeman scored on a wild pitch in the top of the 11th, Casey Coleman was unable to hold the lead as old Chicago nemesis Andrew Toles hit a walk-off three-run homer to end it. Duane Underwood, Jr. entered with an ERA above 11 in the opening inning and 2.78 after. But other than a hit batter, he escaped the 1st unscathed Friday, and would in fact give up no additional base runners until the 4th. On the DL for almost two months, Mike Freeman (.267/.310/.386) returned to Iowa after a short rehab stint in Arizona and sparked the offense by reaching base 3 times and scoring 3 runs. What was expected to be a premier starting pitching showdown, turned out to be a bit of a dud. The Smokies forced Dylan Cease to throw 42 pitches in the 1st inning which forced him from the game. On the other side, Keegan Thompson also allowed one run in the 1st but the wheels fell off after that. He ended up allowing six runs on nine hits and three walks over just 2.2 innings. But hey, the bullpens for each team were great. 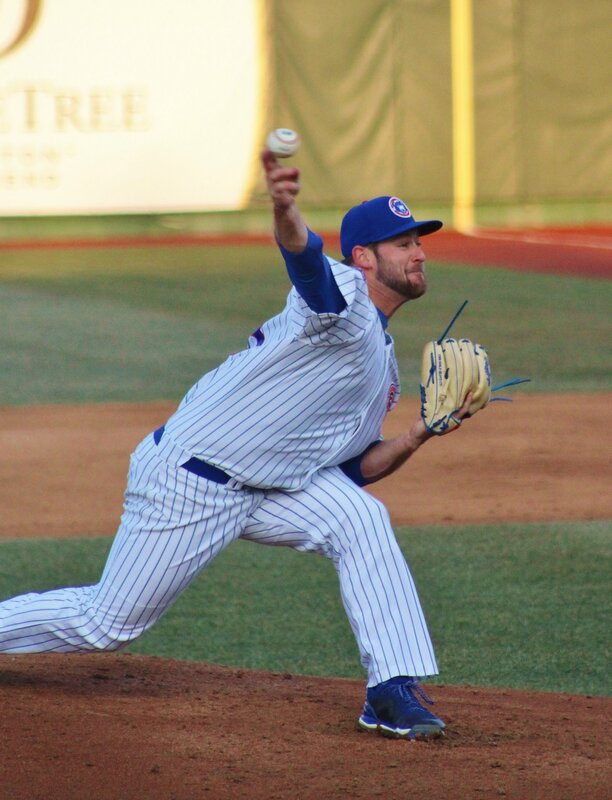 The Smokies pen struck out eight over 5.1 scoreless innings, and the Barons pen was even better striking out nine without allowing a run over the final eight innings. Trent Giambrone (.262/.326/.467) has always been a bit of a streaky hitter but he has over the past month his performance has actually stabalized and even seen a bit of an uptick in terms of plate discipline. Of course, he now has a 4-game hitting streak and two consecutive multi-hit games, so if he is ready to go on another tear, I'm sure no one will complain. Maybe 1-0 wins are going to be contagious. And maybe Cory Abbott (8-6, 2.74 ERA, 105 IP, 86 H, 33 BB, 120 K combined between A/A+) is cementing his case for Minor League Pitcher of the Year. He was really impressive in this outing. He struck out nine over over six innings as he worked his fastball and slider in and out and up and down in the strike zone while also mixing in his curve and change. Since June 29th Cory Abbott has gone from good to great. Over these 8 starts he has a 2.01 ERA and just 34 hits and 14 walks allowed in 45.2 innings. Chris Singleton (.209/.264/.315) is batting .345 over his last 9 games. I don't want to, when the score was 11-0. Bailey Clark worked another 2 scoreless rehab innings. Now that he has worked multiple innings in an outing I would assume he will be re-joining Myrtle Beach. After missing all of 2017 due to TJS, Chi-Feng Lee (32.2 IP, 34 H, 18 ER, 9 BB, 26 K) received one start at the beginning of the AZL season but was moved to the pen after some early struggles. He has now moved back to the rotation and made two starts in which he has struck out 10 batters whiel yielding 5 hits and 1 walk in 8.1 innings. 17-year old Widimer Joaquin (.297/.381/.388) is a prospect that Baseball America labeled as a potential power hitter down the line, although with swing-and-miss concerns. The 6'2" 180 third baseman hit his first professional home run on Friday and he also walked twice. Another 17-year old with power potential signed during the last IFA period, outfielder Jonathan Rodriguez (.248/.302/.357) is batting .361 with 6 stolen bases and 10 runs batted in over his last 10 games. Michael my vote for the Cubs MILB Pitcher of the Year is Abbott. Love his K's/IP totals. Looking forward to how he finishes the season. Lots of potential SP depth developing in the system. Would really rather see a MiLB pitcher in Pitt tonight rather than Chattwood. Was anyone available? Underwood pitched last night so they could have pushed him back. Mills pitches tonight on normal rest. Abbott looks good. I like him and Thompson. Both know how to pitch and not just throw. How did they do the following year.? In 2018, Jen-Ho Tseng has gone 2-12 with a 6.52 ERA for Iowa, thus far. In 2017, Trevor Clifton went 5-8 with a 5.20 and was an absolute disaster the second half. I remember Michael trying to analyze what went wrong, but nothing glaring jumped out. In 2016, Ryan Williams pitched 6 games before suffering a season ending shoulder(?) injury which he is still trying to recover from. Yes, I know, The 2013 winner was Professsor Kyle Hendricks ,. But if I was Abbott, I think I would just say "No thanks" and maybe ask for a couple of steak dinners instead. I think Abbott, or any pitcher, would love to be honored. "Dud" was exactly the description for the AA game SPs. Cease couldn't find the strike zone and the Smokies had the bases loaded in the 1st and it looked like they'd jump out to a big lead, but they got only one. Martinez didn't hit much but made a great throw from RF to hold a runner at 3rd, saving a run. The "lowlight" was watching Jesse Hodges play 3B. Of the few grounders and liners that went right past him while he stood statue-still, one bounced off his chest while he managed a play on one routine grounder and bounced the throw twice. On the bright side, his two hits raised his BA above .200, but I hope he isn't blocking a good prospect at 3B.